First-time visitors to the friendly mountain resort of Ruidoso are often stunned by the dramatic beauty of the landscapem surrounded by the Lincoln National Forest, with 12,000-foot Sierra Blanca, southern New Mexico&apos;s highest peak, dominating the skyline. That’s partly because Ruidoso flies under a lot of people’s radar, even though regular vacationers are intensely loyal—and probably don’t want too many people to know about it. Well, apologies to Ruidoso fans, but this charming town just has too much going for it to keep the secret. In summer, mountain men and mamas take to the hiking and biking trails, saddle up for horseback riding, fish area lakes, or tee it up at a superb selection of golf courses. In winter, snow hounds head for Ski Apache, run by the Mescalero Apache tribe, and the Ruidoso Winter Park is a snowy playground for sledding and tubing. 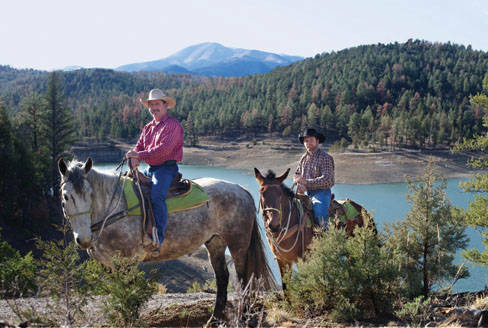 Ruidoso is a pleasure to wander, with its peaceful alpine atmosphere sassed up by Old West spirit. It’s a town of horses and bears. The latter are carved in wood, and were inspired by Smokey Bear, the famous cub found in nearby Capitán. You can buy one to take home, in any size from tuck-it-under-your-arm to larger-than-life. Ruidoso’s name means “noisy river,” for the Río Ruidoso, which tumbles from Sierra Blanca peak down to the Hondo Valley. The Ruidoso River Trail in the center of town is an easy quarter-mile walk beneath shady ponderosa pines, and a great place for kids to let off steam. Speaking of kids, even youngsters get excited about history here in Lincoln County, where Billy the Kid made his mark. Although everyone agrees that the correct pronunciation of Ruidoso is roo-ee-doh-so, you’ll hear plenty of locals waxing lyrical about ree-oh-doh-so. And many visiting Texans lilt an a on the end instead of an o. In this easy-going town, however you say it, there’s plenty to enjoy. Easy-to-stroll Sudderth Street in midtown Ruidoso offers a host of specialty stores. In just one block you can browse Books Etcetera, pick up New-Mexico-landscape–inspired stoneware at White Mountain Pottery, try on Native American jewelry at Apache Trading Company, find treats at Misty Mountain Gourmet, and peruse gifts and hand-painted glass at Rainwaters. Further along Sudderth, Rustic Diva’s flirty fashions get you into the cowgirl spirit, but won’t look out of place back in the city. Cut a dash two-stepping in cute embroidered cowboy boots, or go for Western dazzle in embellished jeans and sparkly belts. This Smithsonian-affiliated museum is not a difficult spot to locate: Look for the horse sculptures rearing and galloping out front. The Hubbard is home to one of the largest collections of horse-drawn vehicles in the U.S., and it’s intriguing to inspect the antique buggies, wagons, and early fire engine that our ancestors considered state-of-the art-conveyances. Kids can clamber over a wagon and play in a tepee. Changing exhibitions include the second Biennale Grande, a juried ﬁne-art competition honoring contemporary visual arts of the American West. It runs until July 15. 26301 Hwy. 70 W.; (575) 378-4142; www.hubbardmuseum.org.